There’s a bedroom in my home that is painted an awful, comic book shade of blue-green. It may be one of the reasons that houseguests usually leave after just three days. The bizarre shade was one of those mistakes that can occur in trying to assuage a mini teenage rebellion. Time passes, kids grow up, tastes develop, and now my daughter’s got her colour tastes all sorted out. While we’re on the topic of transformations—Take leftover plain cooked white fish and potato, dress it up with tasty tidbits and voilá! You have spicy, beautiful, palate-pleasing Emerald Fishcakes. Heat a tablespoon of coconut oil in a large pan on medium. Add garlic, chili, ginger, onion, masala, salt, pepper and coriander stalks. Stir, and when the onion is softened, add the potato and fish. Cook, stirring for a minute or two until the ingredients are dry. Remove from the heat. Mix and mash ingredients in the pan. Add egg, coriander leaves and flour. 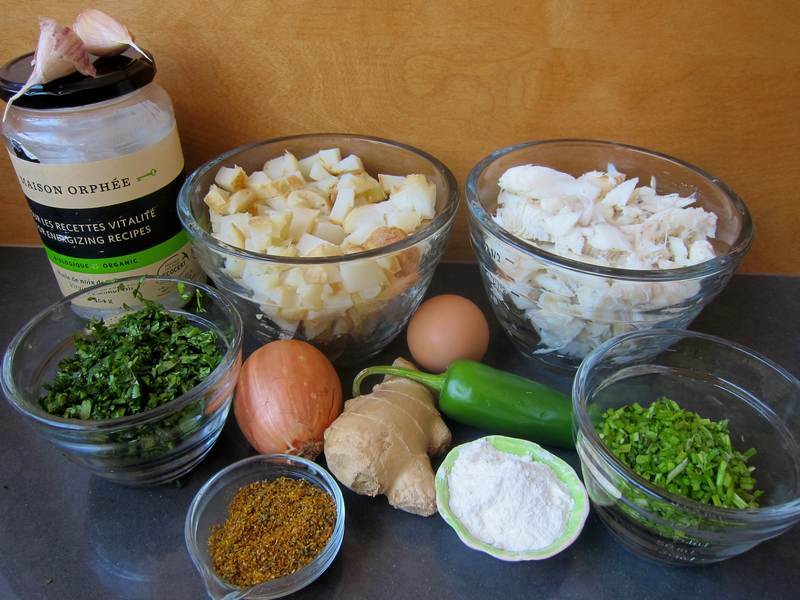 Form the mixture into 16 fishcakes, laying them out on a large platter. 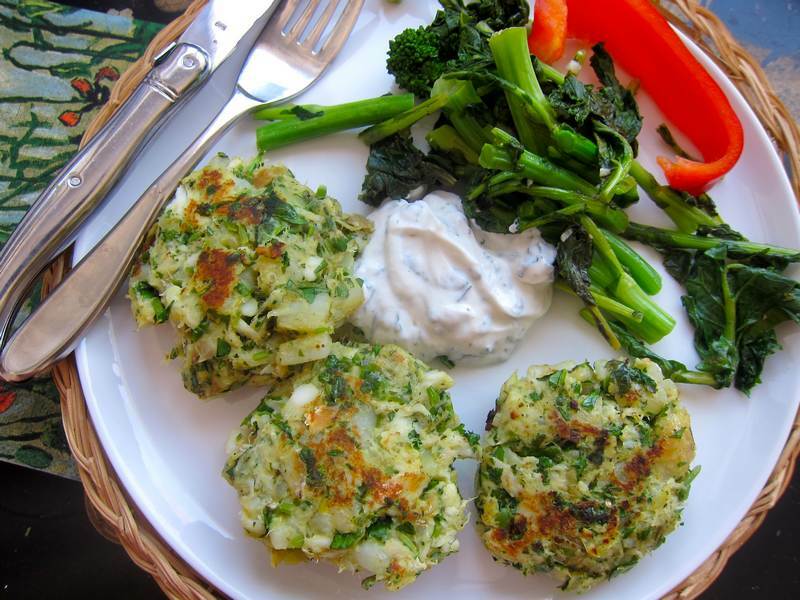 Wipe out the large pan, then heat a tablespoon of coconut oil on medium, and fry the fishcakes 2 minutes per side. Add more oil if needed. Place fishcakes on paper towel. Serve with Yogurt Mint Sauce and cooked vegetables or salad. Serves 4 as a main meal, 8 as an appetizer. Note: To make these Emerald Fishcakes, I used haddock, roasted for 10 minutes at 400F with a little olive oil, Herbamare and freshly ground black pepper. Then I squeezed on some lemon and drained all the liquid before refrigerating.—and I just removed the thin skin from some yellow fleshed baked potatoes. I used madras masala instead of garam masala. The latest news on ridding the body of toxins—Avoid them. Great tecipe. I usually try to make extra fish with an evening meal, just so I can make fish cakes later in the week. And I’m just now coming to that conclusion as well. Leftover creativity 101! It is ultra healthy! Thanks!! And, I’d say the majority of my recipes get a good rating in the healthy department. Looks scrumptious. Not my morher’s fish sticks! It tastes like a fancy dish you’d pay lots for in a trendy fusion restaurant. So far everyone whose tasted these Emerald Fishcakes has been more that complimentary. Not our mother’s fish sticks by a long shot!